Can visual prompts about time promote understanding in Floortime? Note: Early Literacy updates will resume the last week of May. It can be a real challenge for some of our children to understand concepts of time. This is a skill acquired as part of a higher functional emotional developmental capacity (the sixth capacity) in the Developmental, Individual differences, Relationship-based (DIR) model of Dr. Stanley Greenspan. This week I share some tips I received on this topic from DIR Expert Training Leader and Special Educator, Jackie Bartell, on a recent visit at a play museum. As Jackie watched us play with our son at the museum, she could see where he struggled. He was having the time of his life at this fun ball contraption and we hadn’t seen any other parts of the museum yet. We were telling him that we would look around and come right back to the ball machine. He only wanted to stay right where he was because it was so much fun. He doesn’t yet truly grasp the concept of time or what “we’ll come right back” actually means. It might be strange to us to think our children don’t have a concept of time when they are in school everyday and follow a routine, but you’d be surprised. I know I was! You may have heard me tell this story before. We sometimes drive Dada to the train on the way to school. One day after school a couple years ago, we had to pick him up at that same stop which is a different stop than usual. We had come home from school, eaten dinner, and then headed to pick him up there. It was already dark outside. As we were driving there, which is the same route that we had taken to school that morning when we dropped him off at the same stop, our son started crying, “No school! No school!“. I explained to him that no, we were picking up Dada and going right back home. It took a bit of co-regulating to calm him down and ease his anxiety! It hit me like a ton of bricks! I could not believe that he would think we were going to school in the evening when he already had school all day. We always talked about events happening in 3 more weeks, 2 more weeks, 7 more days, 5 more days, 2 more days and he seemed to understand. We also had been using “first… then…” to help him get through transitions with success. So this was a big shock to me. When our son was first diagnosed we heard a lot about visual schedules and boards with mini velcro picture cards that we could move easily to help him choose an activity or understand what was happening next. Personally, I never found them to be so helpful for our son. I know they used them at pre-school and even later at school, but it always seemed to me that looking at a picture wasn’t the same as understanding what would happen. It was just something he would go along with or memorize. Now that our son is developmentally further along, showing him a fist is something he can see and understand to represent something else. His symbolic thinking is emerging. Pairing the idea of a visual in front of him with the verbal language was an extra prompt to help his comprehension. And here at the museum, I could see that our son really looked at Jackie’s fists and seemed to comprehend what she was saying better than when I only said it verbally, when it provoked his anxiety. With the visual prompt, he didn’t have to wonder as much, which provoked the anxiety, when he would see the ball machine again. It was there in front of him. Form and Function has timers! Jackie said she thinks of it like a calendar that we all have that we rely on to support us through the day. She says our kids also should be allowed to have some tools like this, especially when their worlds often can feel so out of control, and when we want kids to make transitions that are part of daily life when it may not be the ideal time to work on the concepts. 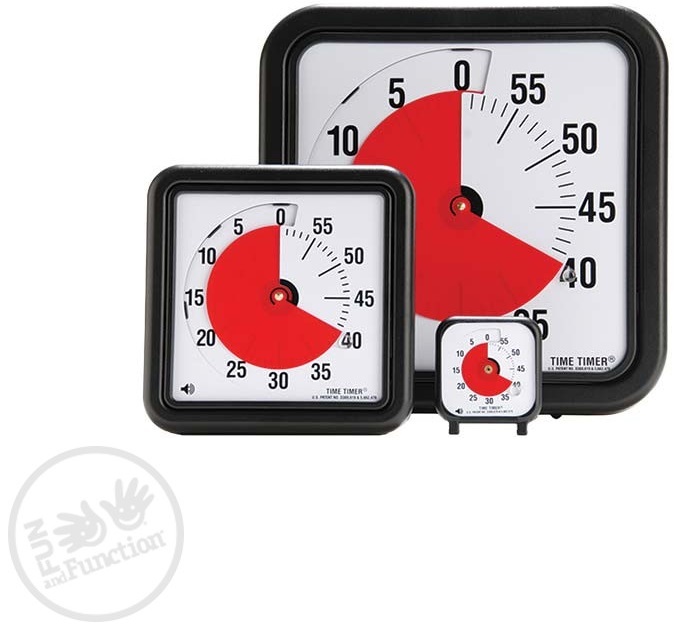 She also suggested the use of a timer, like that shown here, to visually show him that in 5 minutes, for example, we will move to the next part of the museum. The timer with the red is easiest to understand because it’s so visually obvious as it moves around. Again, this is meant to be used as a simple tool to aid with transitions under pressure–not as a replacement for working on higher concepts in Floortime. Visual prompts and cues are helpful in the moment, especially when kids are in distress and having a hard time, but it should not be your first immediate “go-to”. The goal is not just to get a kid through an activity or situation, but for the child to understand it. Whenever possible, we want to work through the situation slowly with the child, even in hard moments. The work on the concept and the abstract parts of understanding “time” will come when we work on those higher level capacities of abstract thinking and building bridges. Making daily transitions are stressful for our children, and with that comes decreased engagement and capacity to think symbolically. So the visual representations can be quite helpful. However, we need to beware not to rely on them alone. A major aspect of Floortime is supporting the amount of time it takes our kids to process and make sense of these difficult abstract concepts. We don’t want to become reliant on a visual aid and assume they understand the difficult concept because they are used to it. That is, we shouldn’t let an opportunity to inspire growth and learning be replaced by something that is rote and memory-based where instead of the child understanding, the child memorizes the visual aid or what it represents. Floortime takes a lot of patience. For our children to understand a concept like the passage of time, they have to be thinking symbolically, and it won’t happen overnight. It can take months and months before a concept is mastered. So when we do have the time and patience, we do Floortime as often as we can, where we share joy together and playfully introduce the concepts our children are ready for. We foster their capacity to think and figure these things out with our guidance. In the meantime, when life gets in the way and we need to make transitions that are hard for our children, visual prompts can help those who are developmentally ready for them. We still attune to our child, use patience, and co-regulate as needed, but the visual prompts can make the transitions a little easier for our son. I am grateful to Jackie Bartell for these tips she gave us. I hope you found this post helpful and will Share it on Twitter or Facebook below. Feel free to share your experiences with transitions and what helped you in the Comments section below. Oh my goodness, my son has had the exact same experience at a museum with a ball machine. I love the fist visual, especially for its simplicity. You always have your fists with you!